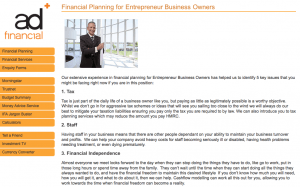 AD+ Financial is a separate company providing independent financial planning advice. Helping you achieve financial freedom is a one of our three brand promises. Our sister company ad+ Financial works closely with our accountancy and tax teams to ensure you accumulate and preserve personal wealth from the success of your business. 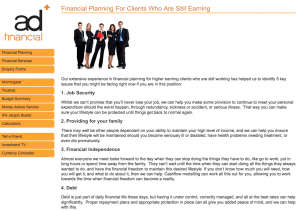 ad+ Financial is a separate company providing independent financial planning advice. If you’re still in employment, there are great opportunities for financial planning that helps to manage your pay in a way that will ensure you are able to live in the style to which you’ve become accustomed, even after you retire! You may be so busy “taking care of business” that you’re not taking care of your own plans. What happens when you decide to take a step back, or want to move on, or just need a little more freedom to take more time away? 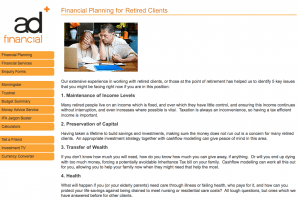 Already retired, your considerations include your own personal financial planning needs as well as that of your family.